After Nathaniel Hawthorne married Sophia Peabody on July 9, 1842, in Boston, the couple left by carriage for Concord. 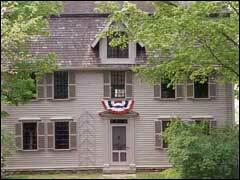 They moved into the gray frame house Hawthorne referred to as The Old Manse in 1846 in his collection of short stories, Mosses from an Old Manse. The Hawthornes rented the house which was built c. 1770 by Rev. William Emerson for his wife, Phebe. When Emerson died in 1776, Phebe married Ezra Ripley, and they remained in the house. Ezra Ripley died in 1841, and the Old Manse was available for rent by the Hawthornes who lived there until 1845. During their residence in the Old Manse, they had their first child, Una, who was born on March 3, 1844. In 1845, the Hawthornes left Concord for Salem after being unable to pay the rent on The Old Manse for several months and because the Ripleys wished to return to the house. To save money, the Hawthornes moved to 12 Herbert St. where they lived with the Salem Hawthornes. The Emerson-Ripley descendants owned the house until 1939 when it was sold to The Trustees of Reservations; it is this organization which owns and maintains the house today. Among the furnishings still in The Old Manse, which is open to tourists, is the desk at which Nathaniel Hawthorne wrote. Also at the Manse is a re-creation of the vegetable garden which Henry David Thoreau planted for the Hawthornes before they arrived; the garden is based on the journals of Hawthorne and George Bradford.